Out the Back Door | A Sharmed Life! The odd red maple tree branch peeking out of the trees at the cottage tells me that summer is almost over. Today is the last day. 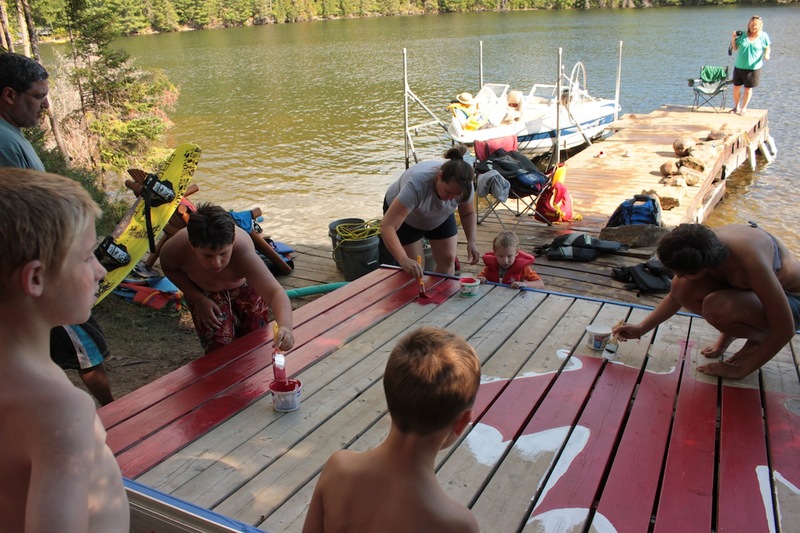 Despite a last summer project that involved painting the Canadian flag on the floating dock, there is no denying the fact that today is clean-up day. Our summer this year has been full of cottage time, New York parks and adventures, visitors and family, and making the most of having Sarah and Matt with us for three months that came and went so quickly. At the cottage, one of the constant sounds is the endless slap, slap, SLAP of the screen door as each of us go in and out at least 50 times a day. When we lived in Manor Park, the in-and-out pattern was no different. Now that we live in an apartment in New York, I realize popping out the back door is a way of life for us and probably for most Canadians. Besides summer’s end, this post marks the end of our first year living in New York City. If I was to think back on some of my observations about it, I would comment that certain ways of life for New Yorkers hit me out of the blue. As I try to take in this unique way of living, there are certain “I get in now” moments. Working at home for the past year, I often get up from my desk to stretch and look out one of the windows of our apartment. What I usually see on our block is doormen hailing cabs, and people walking their dogs, taking kids to the park, carrying takeout to eat lunch at the park, with chairs, towels and books. It all looks completely effortless, so much so that I finally realized that the ease of this activity comes with it being a way of life. For New Yorkers, going to the park is our equivalent of popping out the back door. Because most New Yorkers, including us, live in apartments, all the beautiful parks around the city become everyone’s back yard. These parks are enjoyed by millions in a way I wouldn’t have understood before living there. With Sarah and Matt, Kevin and Scott, we spent our fair share of time in the park this summer. Nobody logs more hours in our “own” backyard, Carl Schurz park, as Kevin. Besides loving to see the tug boats, the kids and dogs playing, this summer he enjoyed arts and crafts and music programs. While we missed the outdoor movie (one of my defining New York scenes from a movie), I liked hearing the big band and our friends commented on the hearing the jazz ensemble as they headed out one day. Our Central Park memories include walking through the park and around the reservoir, talking a break on the Great Lawn while watching a random baseball game and Sarah and Matt in running races. Around us sat a group of teens hanging out and what seemed like thousands of people throwing balls and frisbees and having picnics. A blast from the past one day included a stop at an ad-hoc roller derby rink on a very hot day, where some of the moves were impressive and others were just part of the fun. Another nice memory came on the day we all walked over the Brooklyn Bridge and then relaxed in the park on the other side. After the mandatory lounge on the soft green grass under the bridge, Kevin and Scott had a ride on the carousel and we all loved the ferry back to Manhattan. As we trek back to NYC tomorrow after we drop Sarah off in Kingston, the happy summer 2012 memories and photos will have to last us until next time. It’s a Sharmed life…! Next > More than a Walk in the Park!